What really is the most popular UK diesel type of all time?...This is the big question we try to answer in our new 90 minute long programme. The running order is based on the results of our 6 month on-line survey, where we asked fans to vote for their favourite type of locomotive. 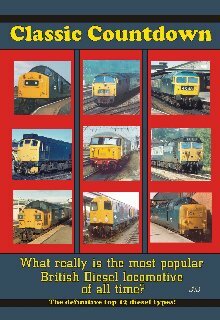 We can’t give away too much but suffice to say the programme is ‘Shed’ free with 18 different types of diesel featured over 6 decades. The countdown commences at No 12 and you can be sure that all the favourites will be in the competition to find the REAL No 1. But can you guess the winner? This REALLY is an hour and a half of compulsive viewing! "Plenty of real railway interest with great shots of green and blue diesels"
As the programme ran through I really got into the spirit, trying to guess what the next class would be"
"Footage is interesting, nostalgic & varied"
"A worthy DVD to add to any collection"